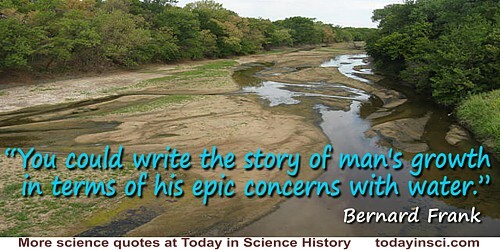 You could write the story of man’s growth in terms of his epic concerns with water. Opening sentence of 'Our Need For Water', United States Department of Agriculture, The Yearbook of Agriculture, 1955 (1955), 1. [Geology] may be looked upon as the history of the earth’s changes during preparation for the reception of organized beings, a history, which has all the character of a great epic. Paper read to the Linnean Society, 7 Feb 1843. In George Wilson and Archibald Geikie, Memoir of Edward Forbes F.R.S. (1861), 343.